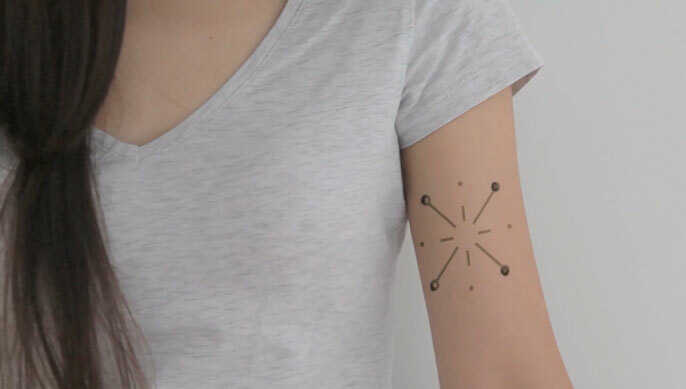 Katia Vega, an associate professor of design, has taken her “beauty technology” a step farther to create biomedical tattoos — a project for which she and her colleagues earned an Interactive Innovation Award at the South by Southwest (SXSW) Conference earlier this month. The tattoos, in which biosensors substitute for ink, turns your skin into an display that changes colors to indicate what’s going on in your body, say, your glucose level. The SXSW Conference, exploring “what’s next in the worlds of film, culture, music and technology,” declared the tattoos “the coolest scientific achievement or discovery that before 2017 was only possible in science fiction.” In winning the “Sci-fi No Longer” award. Vega and team beat out four other projects, including two from Google. DermalAbyss: Possibilities of biosensors as a tattooed interface. Vega collaborated on the project, The Dermal Abyss: When Tattoos Meet Biotechnology, with Nick Barry, Viirj Kan and Xin Liu, MIT researchers during development; and Nan Jiang and Ali Yetisen, Harvard Medical School researchers. As seen in the video: The purplish color “magically” appears.